I finally broke into my package of Tim Holtz Paper Dolls. Lots of fun in there! ;-) Underneath the gear die cuts on the right hand page I did some packing tape transfers from an old technical manual. The actual art journal is a repurposed children's book so on some pages I left the original illustrations peeking through the gesso. Thanks for stopping by and be sure to check out all the cool stamps at Topflight Stamps, your one stop shop for utter wonderfulness brought in from stamp companies spread across the globe. They are always getting in new designs, my wish list can't keep up with them lol! I am also entering this into the Summer Challenge over at SanDee & amelie's Steampunk Challenge blog. There is always cool stuff to see there! Sizzix & Simon Says Stamp links in this post are affiliate links which do not affect the price you pay but allow me to earn a small percentage of a sale. Thanks! Gorgeous, love your cool idea!! Many thanks for sharing with us at SanDee& Amelies Summer Special Steampunk Challenge! 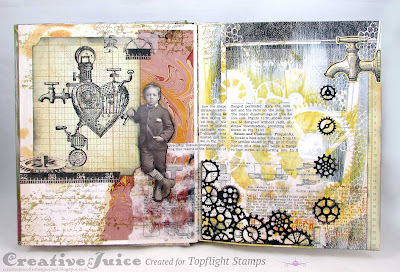 saw your work on facebook !it is a very coool journal page ! love it. 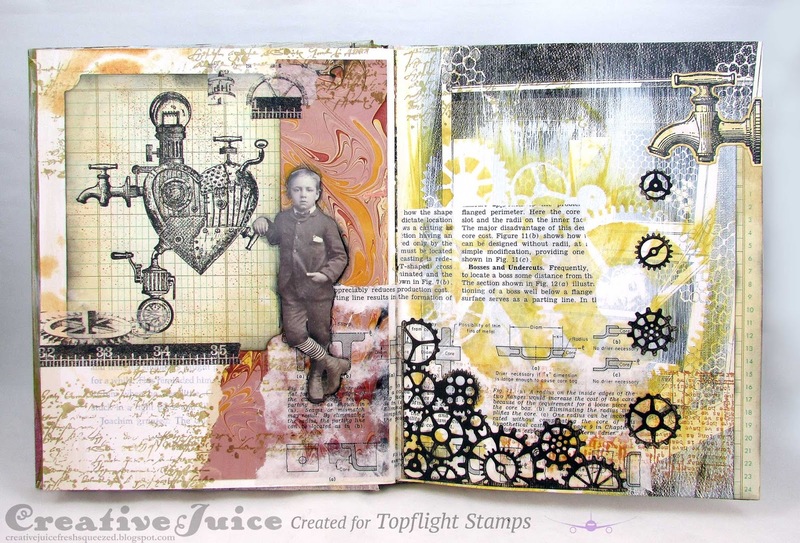 Thank you for sharing your project with us at SanDee&amelie's Steampunk Challenges! Great journal page and with fine sense connected with the themes! Get More Out of Your Dies!